The Rangers Wouldn’t Really Name Brad Richards Captain, Would They? 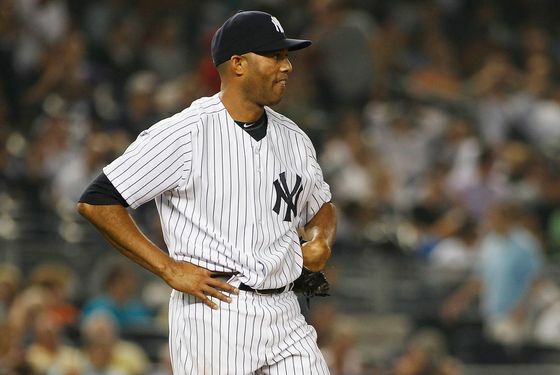 Watching Mariano Rivera falter has always hurt a little more than watching any other relief pitcher falter. It's not as if he's never blown a save before, or given up a run at an inopportune time, or struggled in consecutive games. But he's generally been so dominant — and so consistent — over his career that Yankees fans have been trained to be more confident in the ninth innings of baseball games than any fanbase ought to be. Rivera's set the bar so high, and earned every bit of praise heaped upon him in his career, that his rough patches still catch us by surprise. And he's going through one of those now. Two nights after blowing a save at Fenway Park, Rivera gave up a two-run homer in the top of the ninth to Bobby Abreu. Those runs broke a 4-4 tie, and though the Yankees threatened in the bottom half of the inning, the game would end with Curtis Granderson getting tagged out following the rare successful execution the the fake-to-third, turn-to-first pick-off play. Look, this isn't the first time Rivera's looked human in consecutive games. Last September, you'll recall, he allowed an earned run three consecutive games, including two runs in a game against Boston. But those would be the last runs he'd allow in 2010: He's thrown eight scoreless innings fharrom that point forward, including six-and-a-third in the postseason. Rivera's been so good for so long that it should take more than couple bad outings for anyone to panic. His numbers are a tick down from where they've been in recent years, but let's not forget, his numbers the last few seasons have been among the best of his career. His 2.23 ERA this year is exactly his career average, for instance, and he still has a WHIP under 1 (and below his career average of 1.003). But in the back of our mind, every time he falters these days, we're reminded that the man is 41 years old. One of these days, a stretch like this will prove to be something more than a mere blip in an otherwise stellar season. But he's been so consistent, for so much longer than we've had any right to expect, that it'll take more than a bad week to make us truly worry. Meanwhile, at the opposide end of the consistent-pitcher spectrum, we have A.J. Burnett. Last night, we got a look at both Good A.J. (the one who struck out five batters in the first three innings, and didn't allow a run through five), and Bad A.J. (the one who allowed an Abreu solo homer in the sixth, then gave up a two-run double with the bases loaded, then allowed a fourth run to score on a while pitch). Had Burnett retired Jeff Mathis with the bases loaded, instead of givign up that double, he'd have ended his night having allowed one run over six innings, and we'd be talking today about how he took a step forward last night. Instead, we're talking how he allowed another big inning. (Bleaching his hair, shockingly, did not help very much.) Just as fans have been trained to expect the best from Rivera, we've been trained to expect the worst from Burnett. That's three straight losses for the Yankees, and coupled with another Boston win, they're now 2.5 games back in the East. The Angels, meanwhile, pulled to within six games in the Wild Card race. Ivan Nova pitches tonight, against Garrett Richards. This post has been updated to include the correct Angels starting pitcher for Wednesday's game. Garrett Richards will make the start for the Angels.